Engraving showing the state of works as at September 1808, the end of the second season of construction, (below). The third entire course to be built is nearing completion. The progress made by the following year in August 1809 is shown above, when the last of the solid courses was almost complete. The rope bridge between the lighthouse and the Beacon House is shown. 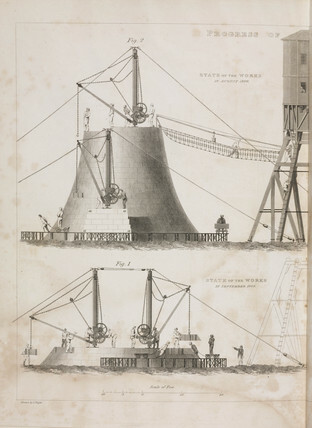 Illustration from 'An account of the Bell Rock Light-house: including the details of the erection and peculiar structure of that edifice; to which is prefixed a historical view of the institution and progress of the Northern Light-houses' by Robert Stevenson (1772-1850), designer of the Bell Rock Lighthouse, published in Edinburgh in 1824.